Meyer Dempsey - mogul, wealthy entrepreneur, arrogant and always in charge - is in New York, on the phone with his ex-wife in LA when the news breaks. He can hear tension in the voices of reporters and experts chronicling all that's known and unknown. But even while those supposedly in charge restrain their own panic, Meyer finds he recognizes bits and pieces of what the world is facing. He's seen this in dreams - in visions of another place. He knows where he and his family must go. He has prepared … though he never knew until now what he'd been preparing for. He knows only they cannot hesitate. They must run to their safe haven in the Colorado mountains. Now. Before society shatters into chaos, and it all falls apart. Meyer has been taking steps for months, and has made preparations: a trove of supplies, a van stocked for the worst, a Gulfstream waiting at a small airstrip in Jersey. But he hasn't yet been able to take the final and most important step: moving the family to Colorado, where every contingency is covered. Panic, once it breaches the thin crust of civilized society, spreads like a virus. Meyer knows only one thing, and it's a truth that has perched in his mind like a psychic obsession: When the ships arrive, his family must be at the Colorado compound or all will be lost. The space fleet in itself doesn't matter. The disintegration on the surviving news outlets doesn't matter. Reports that Las Vegas has been set ablaze don't matter. The fate of humanity, in Meyer's eyes, doesn't matter. Rioting spills into the highways as time ticks away. Unrest boils in city and hinterlands. But Meyer's obsession to reach Vail is single-minded, guided with the focus of a far-seeing nightmare. Gangs can ground his plane, threaten his vehicles, and steal his belongings. But nothing will stand between Meyer's family and their haven … and Meyer will kill his way to Colorado if he has to. 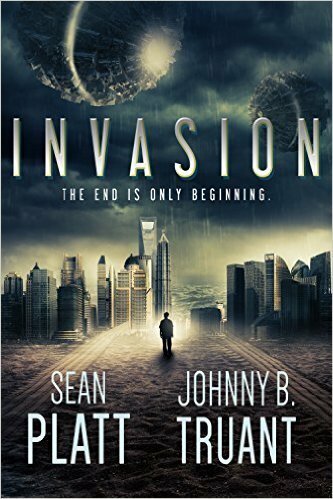 This relentless, page-turning tale of apocalyptic dawn is the first in the Alien Invasion series by masters of story Truant & Platt, authors of The Beam, Robot Proletariat, and more.